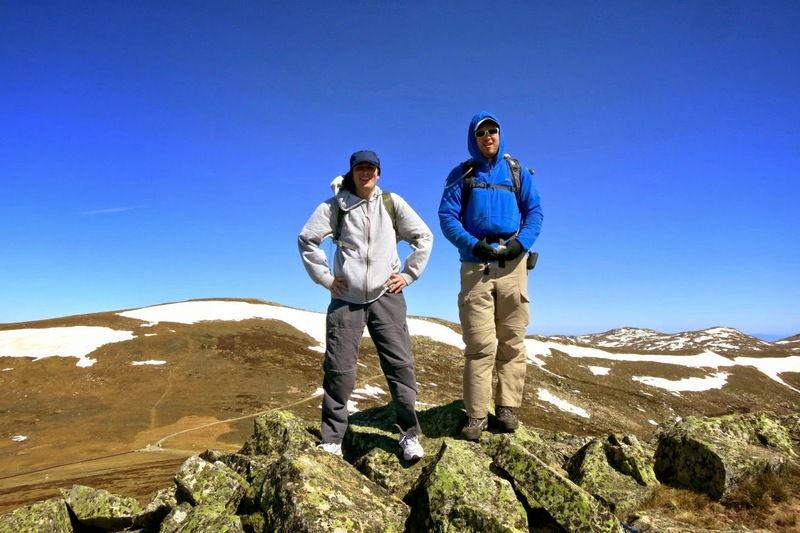 - If a peak has a name, and is 2000 meters or higher, then include the peak in the list. 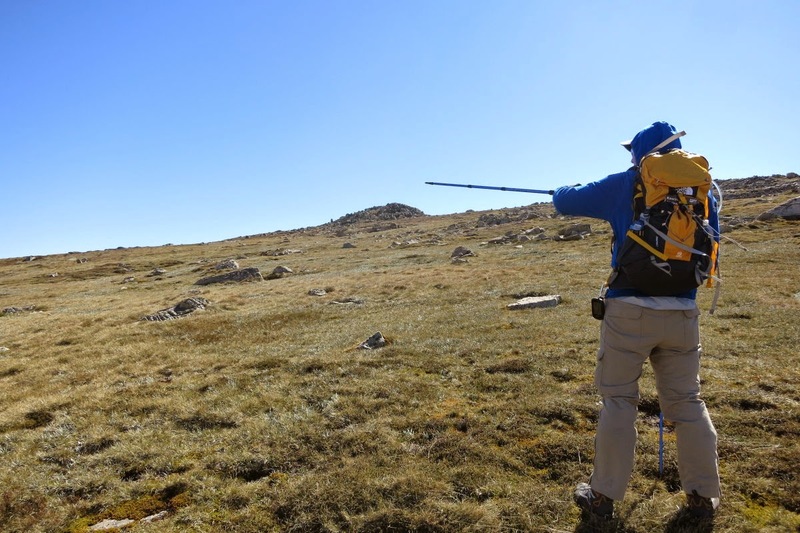 - If a range/ridge/spur has a name, and its highest point is 2000 meters plus, then include the highest point. Scroll forward to the end of this trip report. There is a list, with links, to other A2K climbing trips that I have done. - Park car at Dead Horse Gap Carpark. 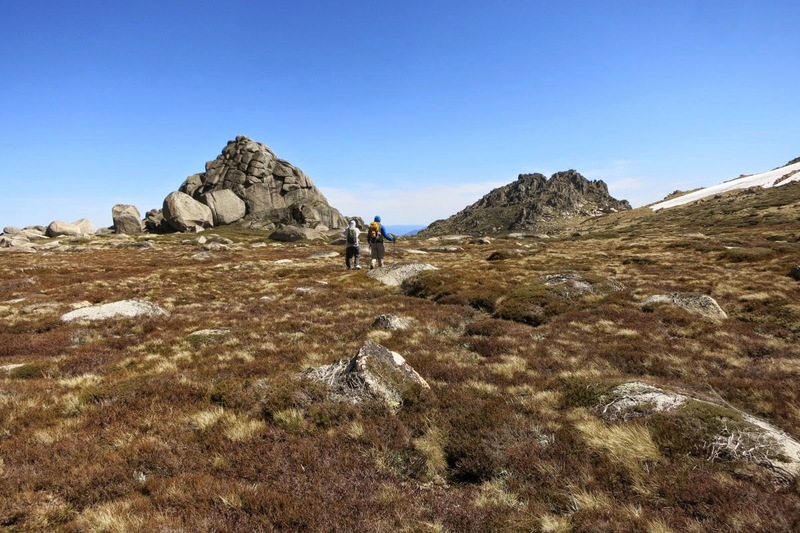 - Walk on Dead Horse Gap Track. - Then Koscisuzko Walk - the steel meshed walkway. 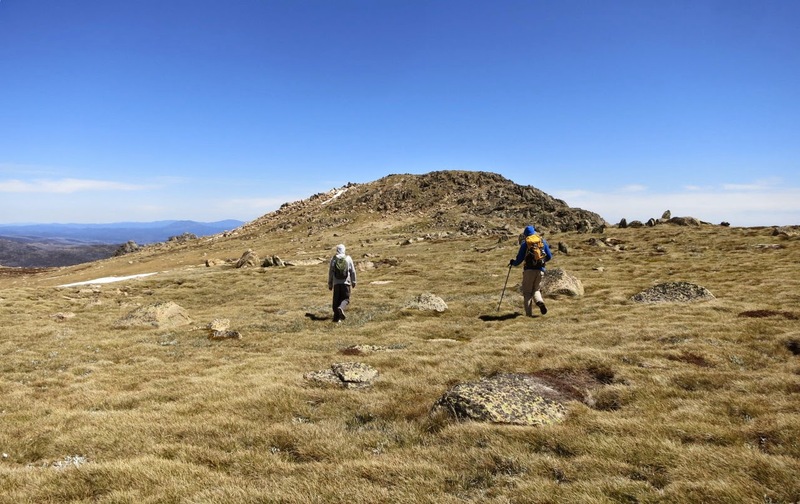 - At a point northeast of Lake Cootapatamba, leave steel meshed walkway and go off-track towards highest peak (unnamed) on Etheridge Ridge. 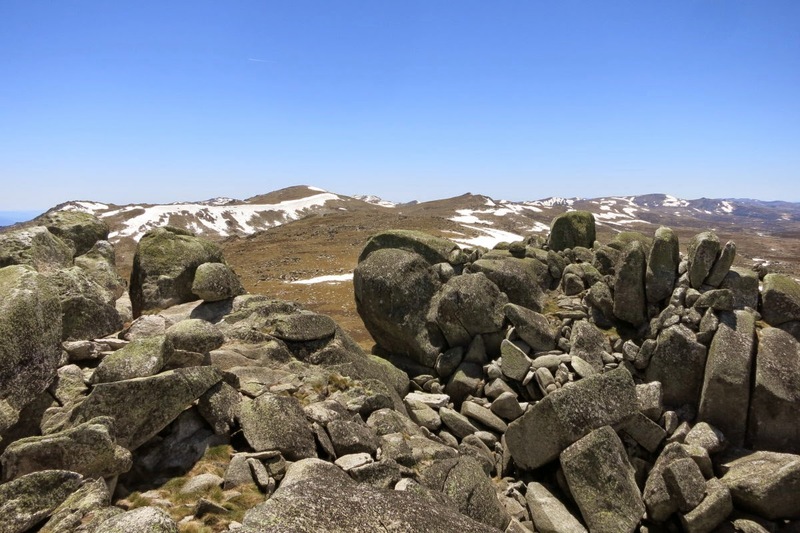 - Then to Mt Kosciuszko. 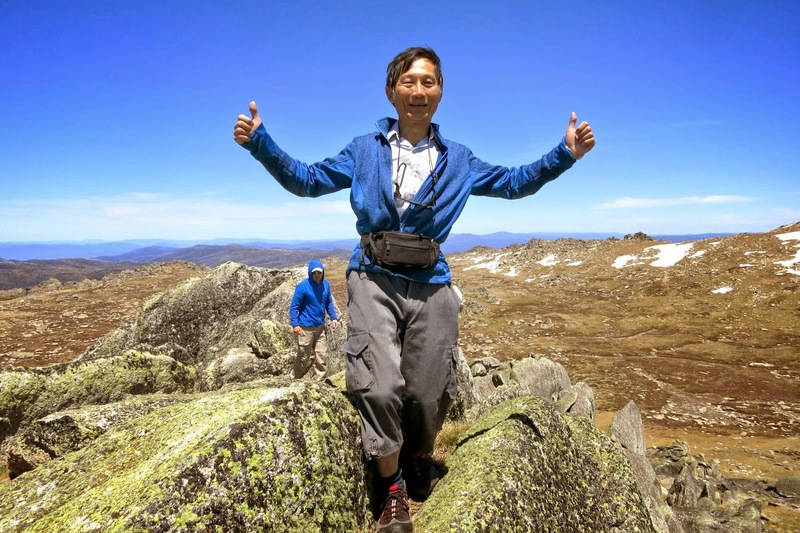 - Afterwards, retrace Koscisuzko Walk to a point northeast of North Rams Head. - Leave track and go off-track towards North Rams Head. - Then to Rams Head. - Then to South Rams Head. 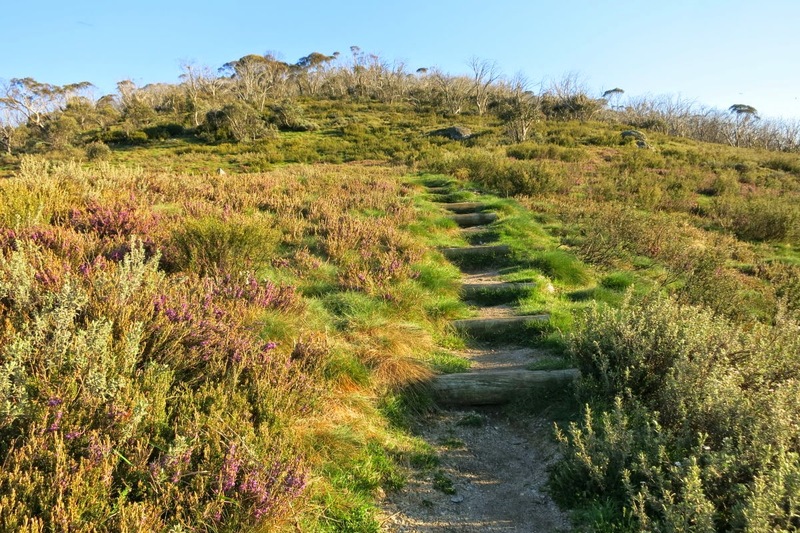 1) The start of the walk is at Dead Horse Gap carpark. 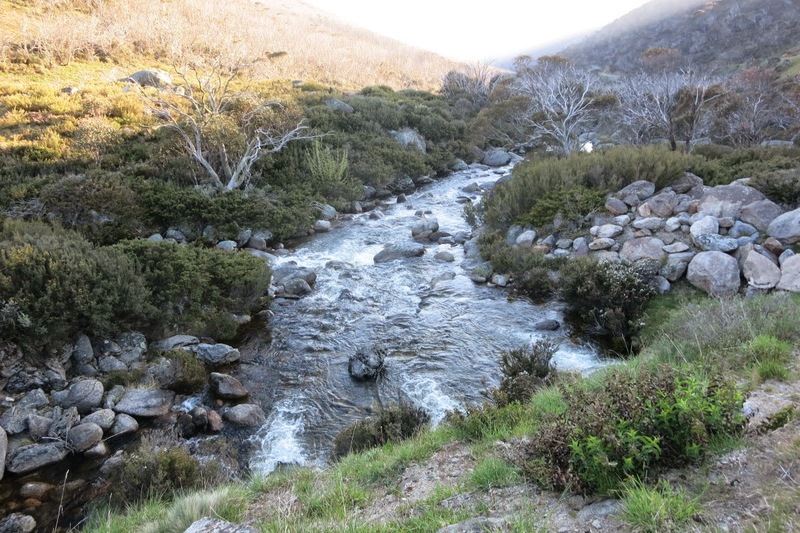 First thing is to cross the Alpine Way, then cross this Thredbo River. There is a new foot bridge over the river now ... brings back memories when I was last here in April 2011. At the time, the only way to cross the river was by stepping on stones jutting out of the water. I slipped, and had both feet landed in the river. For the rest of the day, 10 hrs, I walked with wet feet and shoes ... yeeek !!! 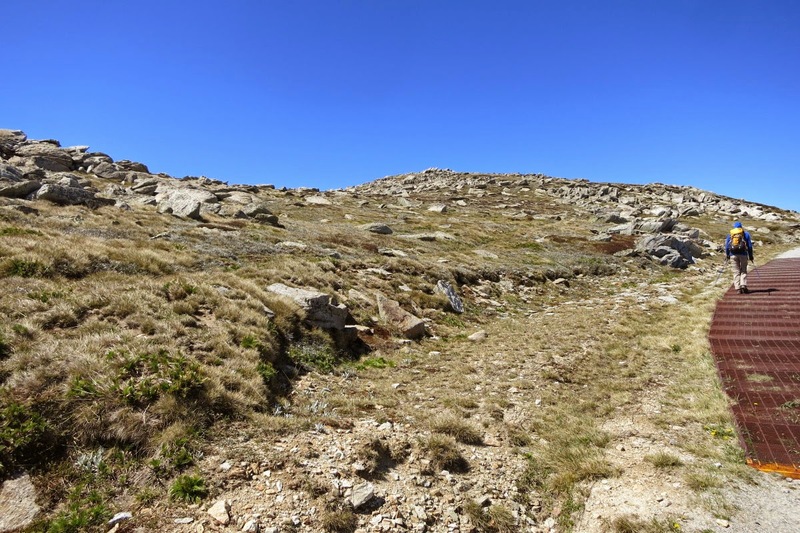 2) This is the start of of Dead Horse Gap Track after crossing Thredbo River. 3) Scene on the Dead Horse Gap Track ... The mountain on the left side is South Rams Head. We'll climb it this afternoon. The mountain on the right is unnamed. 4) Today is very windy and beetles are blown around all over the mountain range. 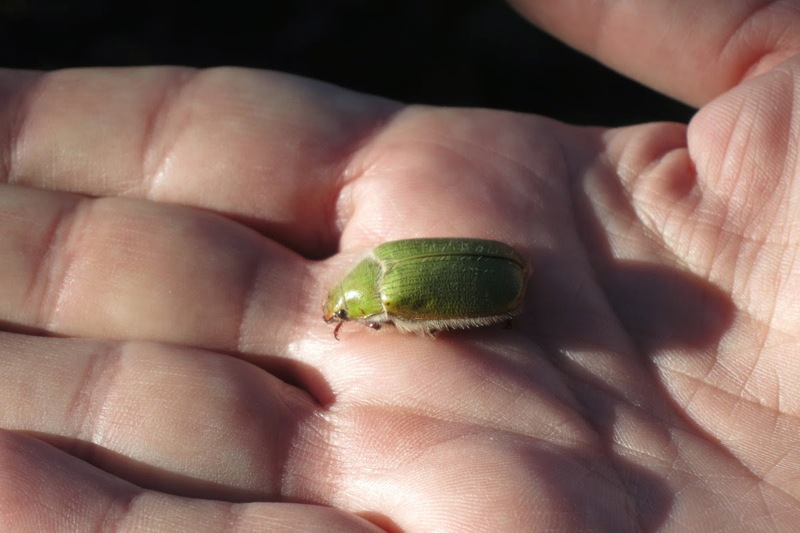 Does any one know the name of this beetle? 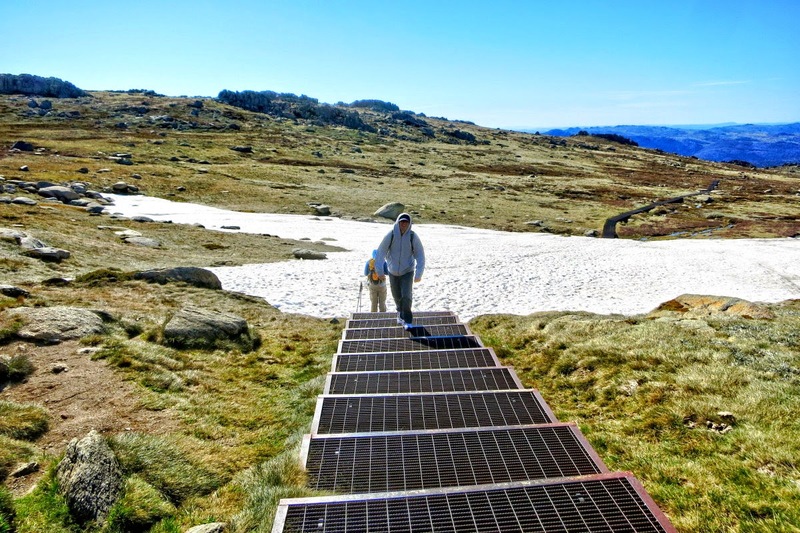 5) About 2 hours later, the Dead Horse Gap Track gives way to the Kosciuszko Walk trail which, as can be seen in the photo, is a steel meshed walkway. 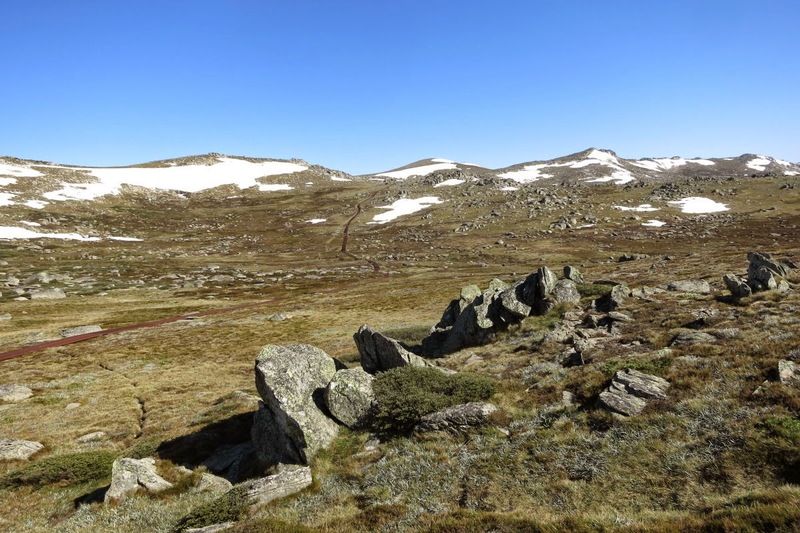 6) You can see the steel meshed walkway leading towards Mt Kosciuszko (2228m) which is the dome-shaped mountain in the middle of the photo. 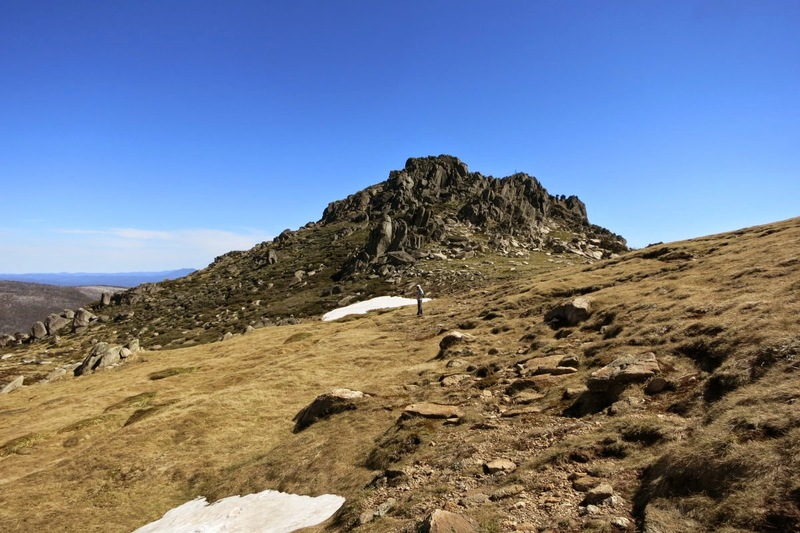 On its right is the highest peak (unnamed) on Etheridge Ridge at 2180m. We will be climbing both these peaks soon. 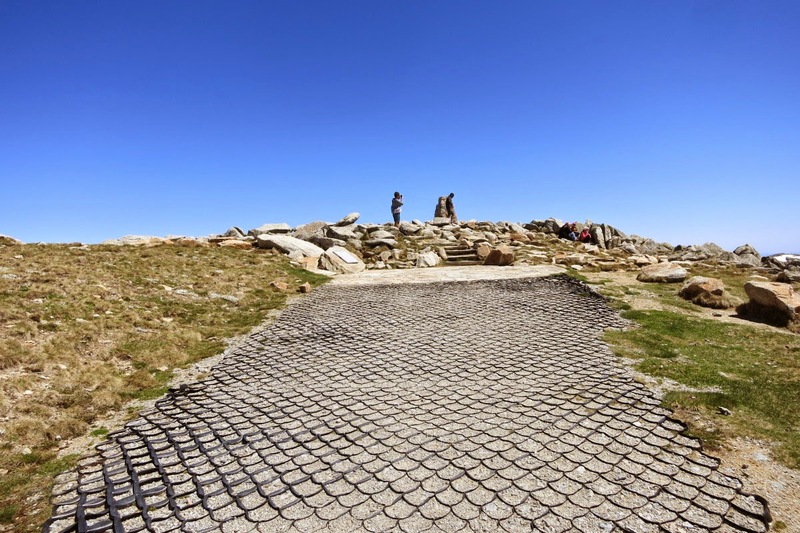 7) Zooming onto Mt Kosciuszko ... near the bottom left corner, you can see a person in red walking on the steel meshed walkway. 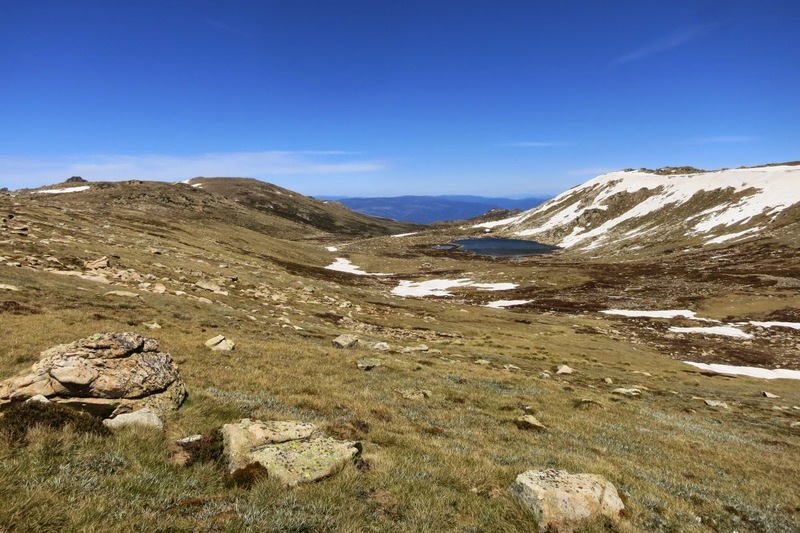 8) On the way to the foothill of Mt Kosciuszko is this beautifully blue lake called Lake Cootapatamba, the highest named lake in Australia. 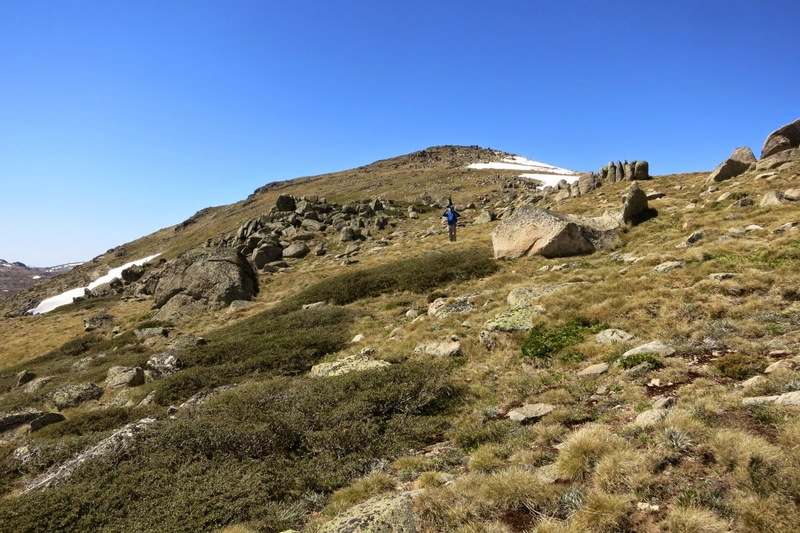 9) At a point north east of Lake Cootapatamba, we leave the steel meshed walkway and go off-track towards the highest peak (unnamed) on Etheridge Ridge ... Adam is pointing at it. 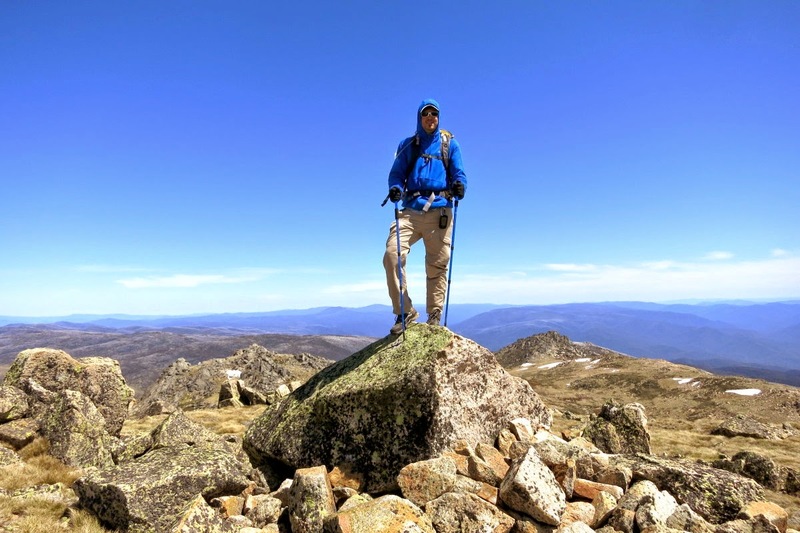 11) I am at the top of the highest peak on Etheridge Ridge 2180m, 5th highest peak in Australia. 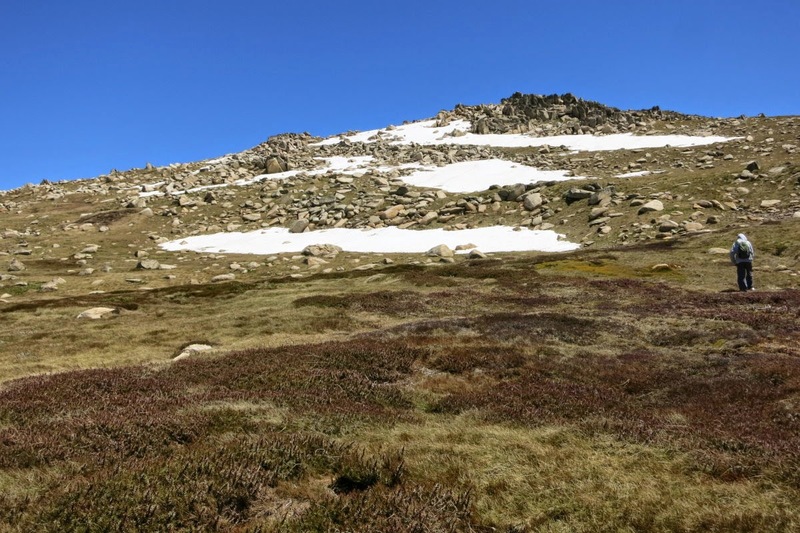 13) We get off the highest peak on Etheridge Ridge which is at the centre of this photo, and are on our way to Mt Kosciuszko. Adam is checking his GPS. 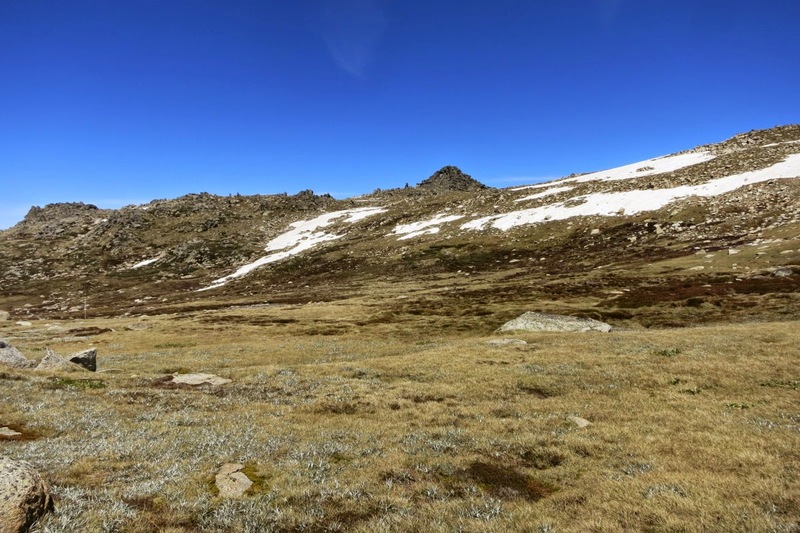 14) The summit of Mt Kosciuszko is in sight (centre of this pic). 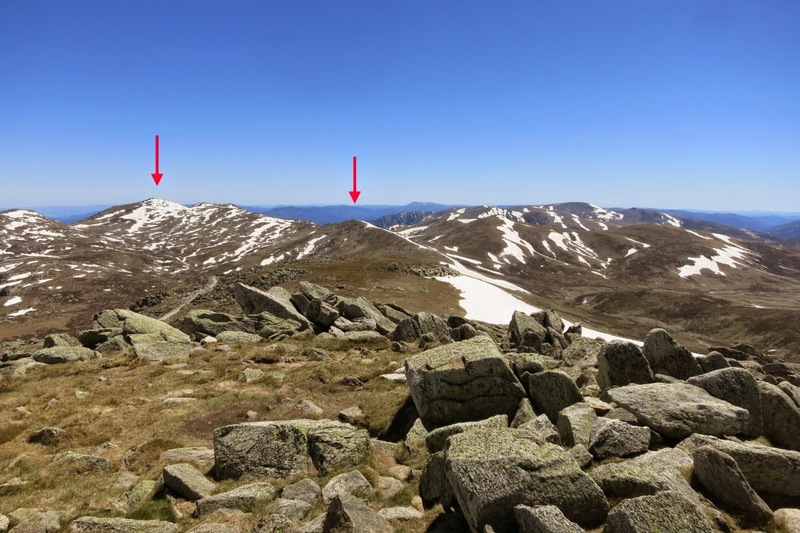 17) View from Kosciuszko summit - Mt Townsend (Australia's 2nd highest mountain) is the left red arrow. Muellers Peak is the right red arrow. Glad to see these old friends again as I've climbed both of them. - North Rams Head is the dark coloured pyramid at the centre of the pic. 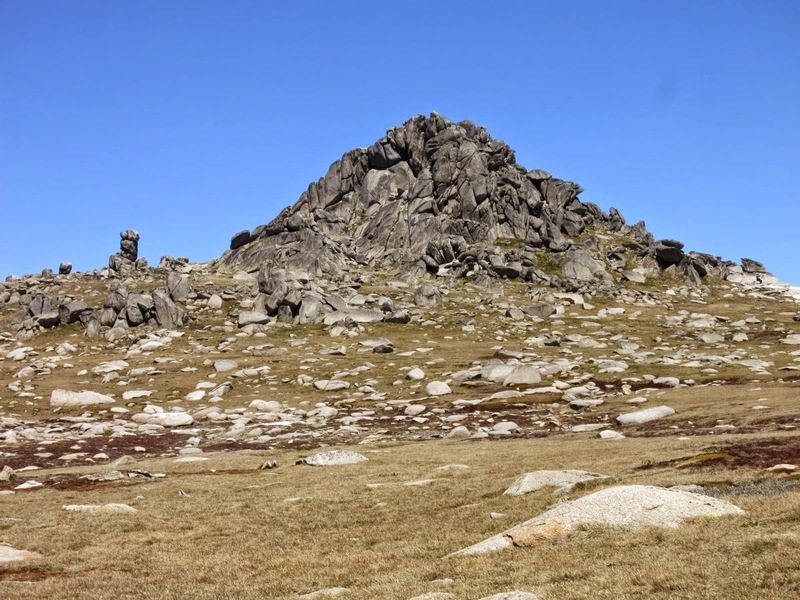 - Towards its right is the partly visible dome-shaped Rams Head (highest peak in the photo). 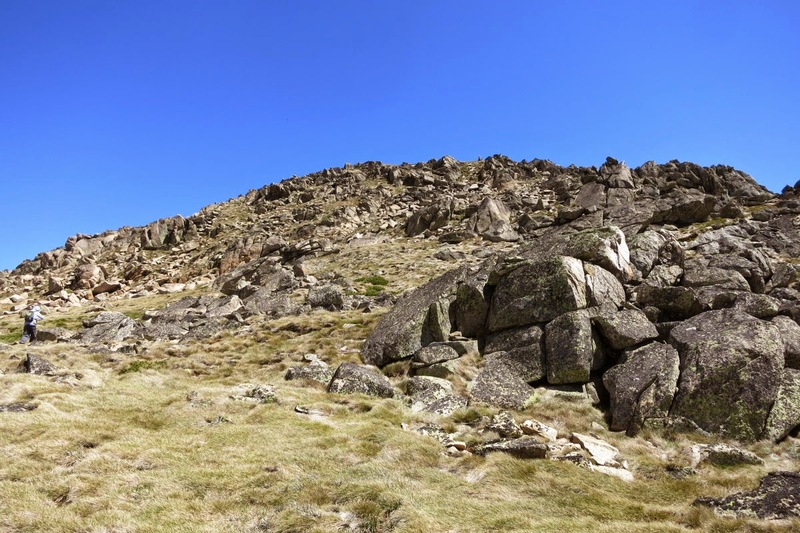 - The next dark coloured mountain top on the right of Rams Head is South Rams Head. After lunch, we will be climbing all three of these mountains. 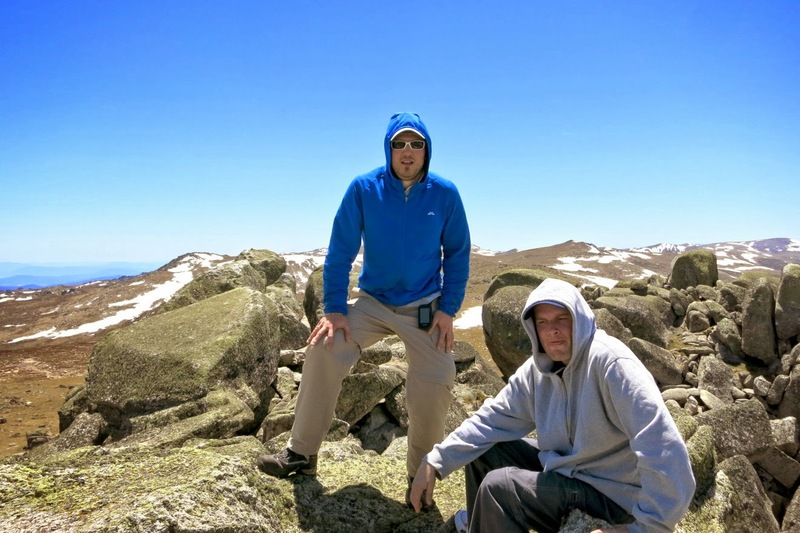 19) Lunch is at the top of Mt Kosciuszko. Afterwards, we retrace the steel meshed walkway to a point northeast of North Rams Head. Then go off-track towards it - centre of this pic. 20) Getting close to North Rams Head ... although the slope on its right side seems gentler, we decide to walk towards the base on the left side instead. 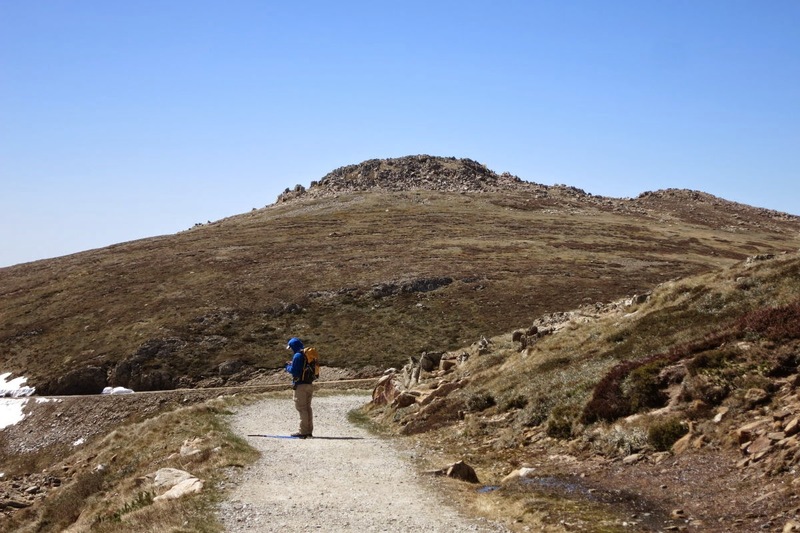 Paradoxically, there, we find an easy route up to the summit. On the GPS, this route is on the east side of the mountain. 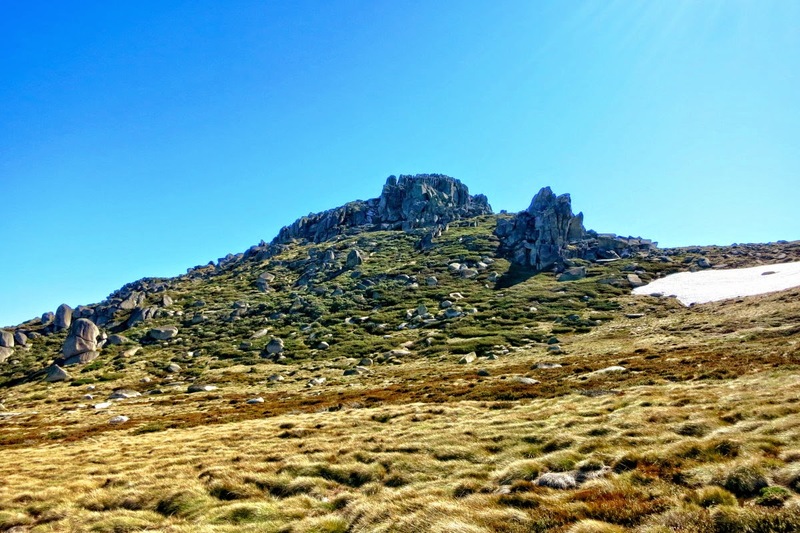 21) The top of North Rams Head, 2177m, 6th highest peak in Australia, actually consists of 3 mini-peaks - each is a stack of granite boulders. They all seem roughly of the same height. 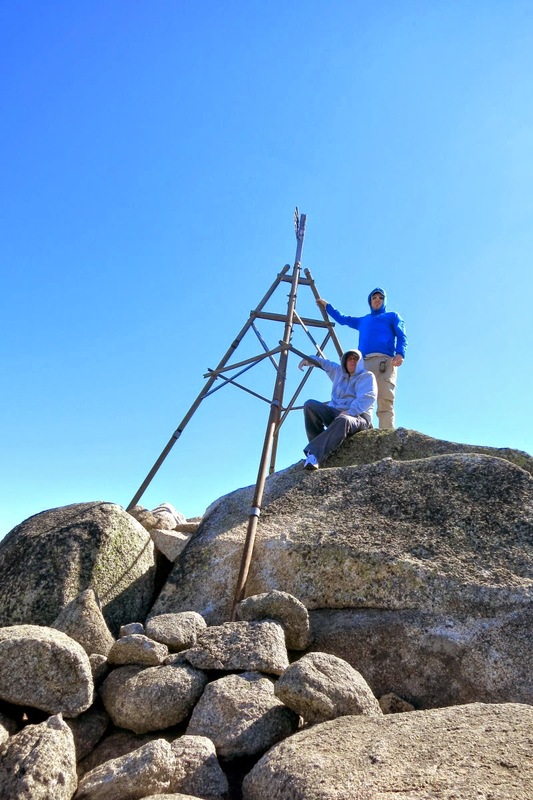 To be sure we are at the top of North Ram's Head, we climb all 3 of them ! 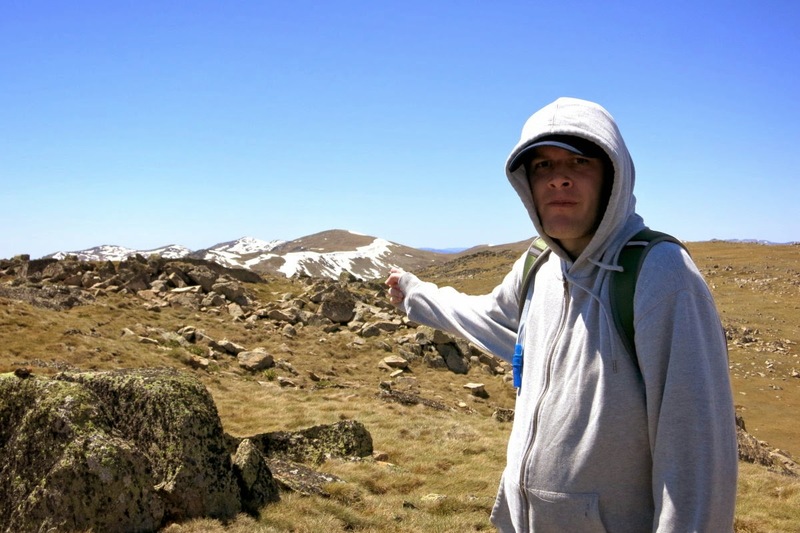 Here is me at one of the mini-peaks. 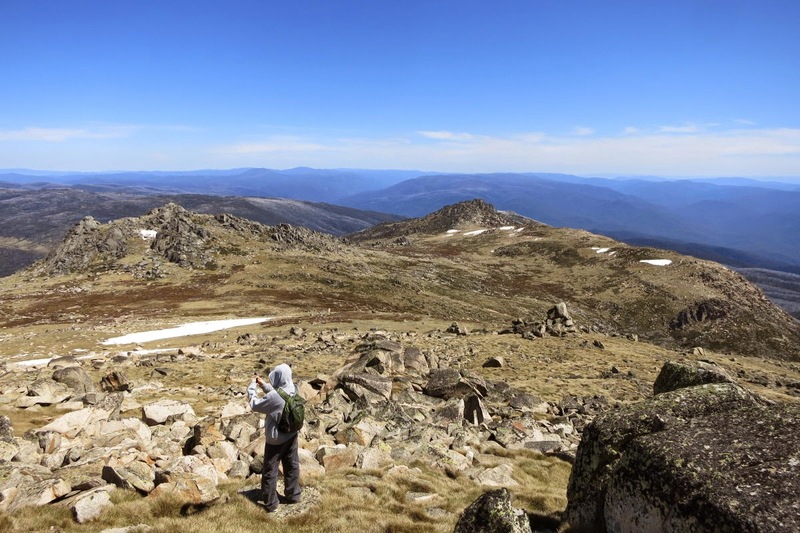 23) From the summit looking back at Mt Kosciuszko which is the dome-shaped mountain, and also the highest peak in the photo. To its right, and also the 2nd highest peak in the photo is the unnamed peak on Etheridge Ridge which we climbed this morning. 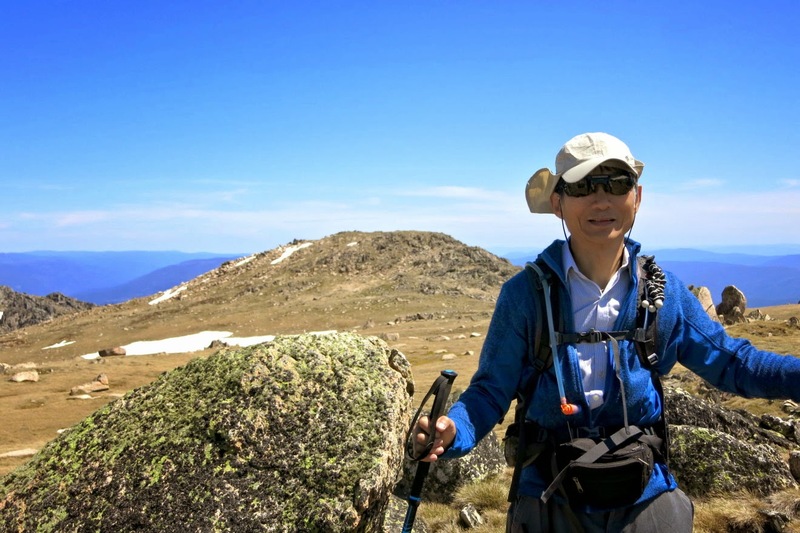 24) Getting off North Rams Head and heading towards a peak on the south west of North Rams Head. On my Garmin Montana GPS, this peak is wrongly labelled as Rams Head. The real Rams Head is directly behind it and not visible in this pic. 25) Getting close to the peak wrongly labelled as Rams Head in my Garmin Montana GPS. 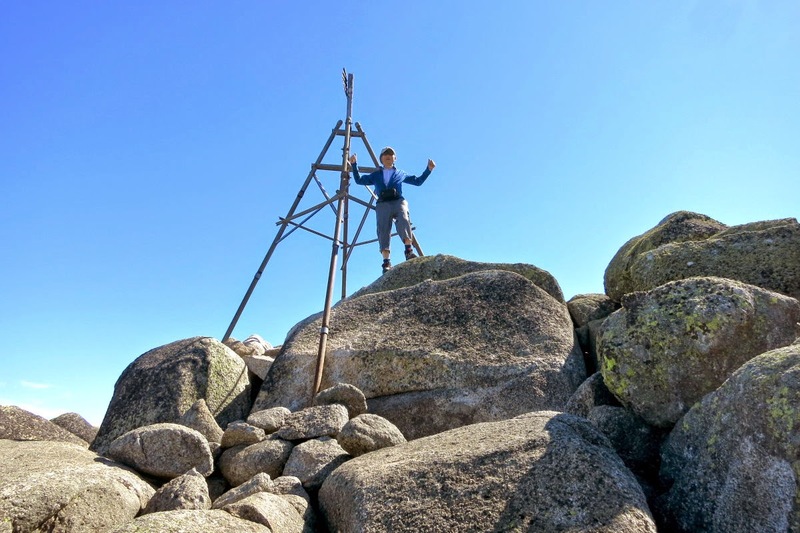 26) Me at the summit - In the pic, the real Rams Head is behind me. 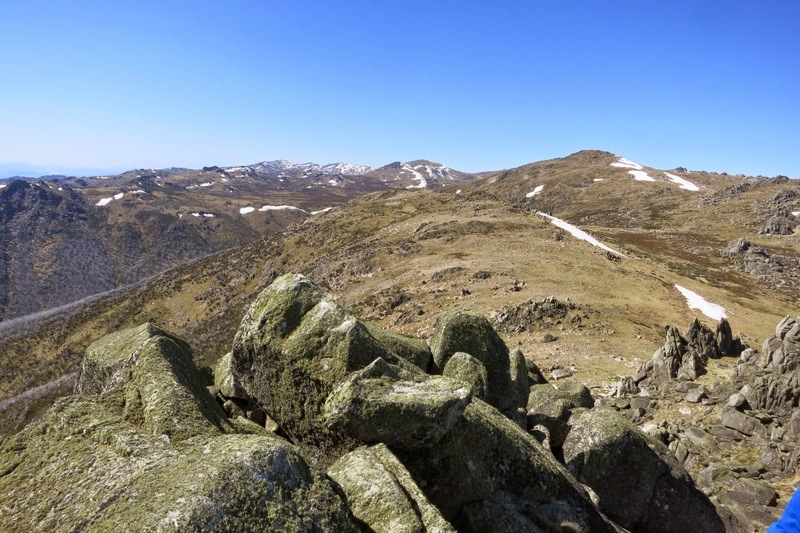 27) View from the summit - looking back at North Rams Head which we had just climbed. 28) We are heading towards the real Rams Head now. 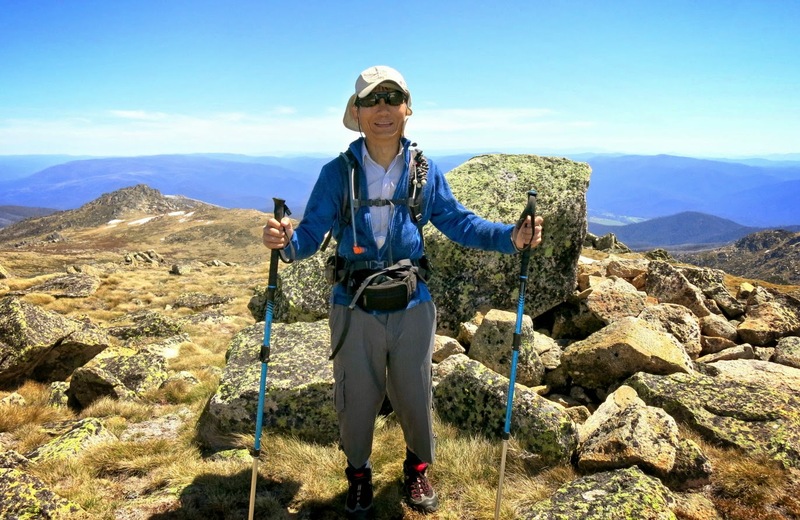 30) I am at the top of Rams Head, 2193m, 4th highest peak in Australia. The rocky mountain on the left side of the pic is South Rams Head. We'll be heading there next. 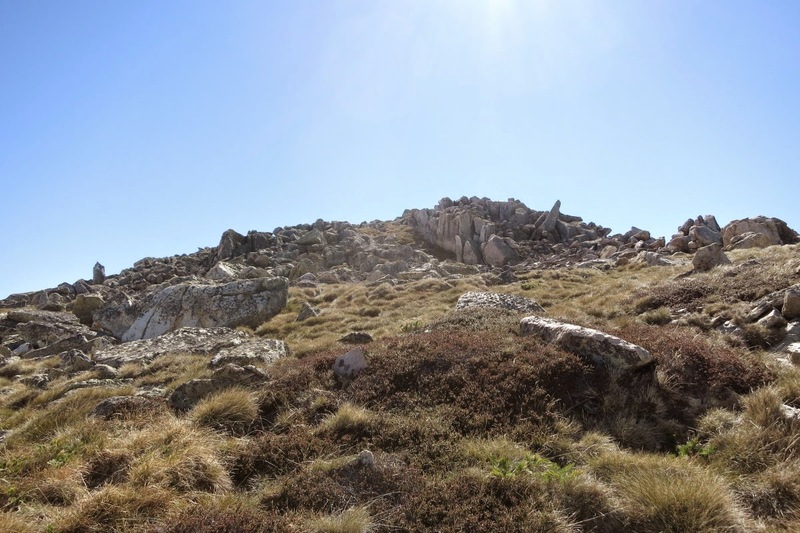 33) View from Rams Head summit - The rocky pyramid-shaped mountain almost at the centre of this pic is South Rams Head. We'll be heading there next. 34) We are off Rams Head and looking back at it. 35) Heading towards South Rams Head ... On the left-side of the pic is a pile of neatly packed rocks. 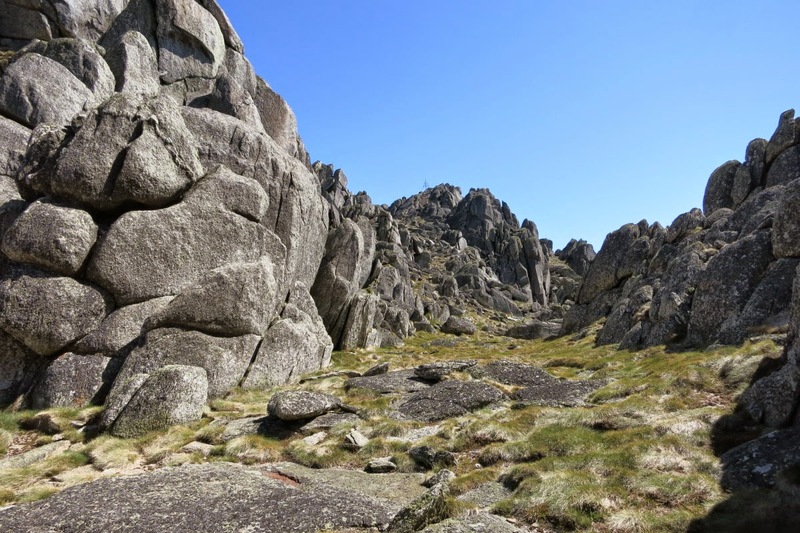 36) These neatly packed rocks remind one of the way the South American Incas built their monuments. 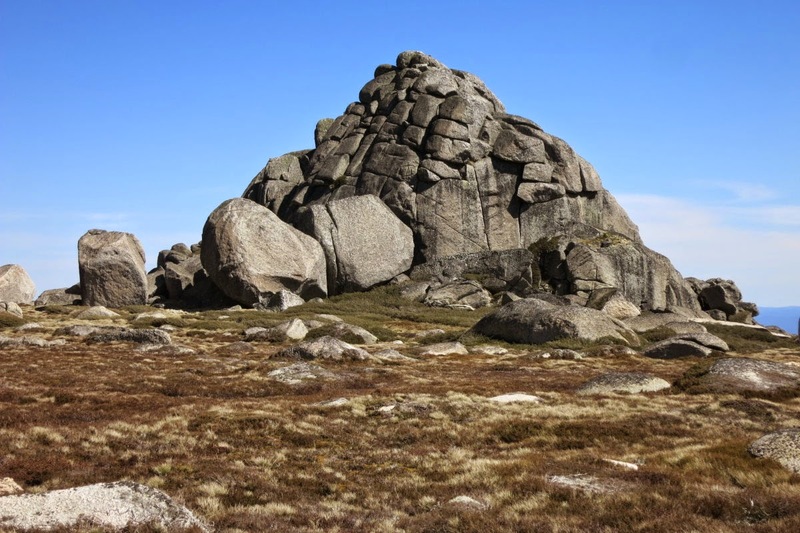 39) Near the peak of South Rams Head, we walk through this interesting valley-like feature with stone walls on both sides ... as if we are in a mythical land. 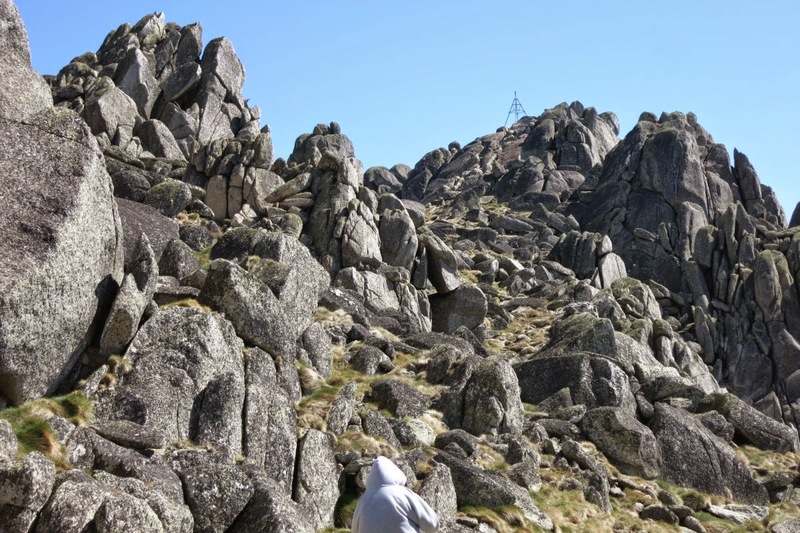 The peak itself is marked by a trig at the centre of this photo. 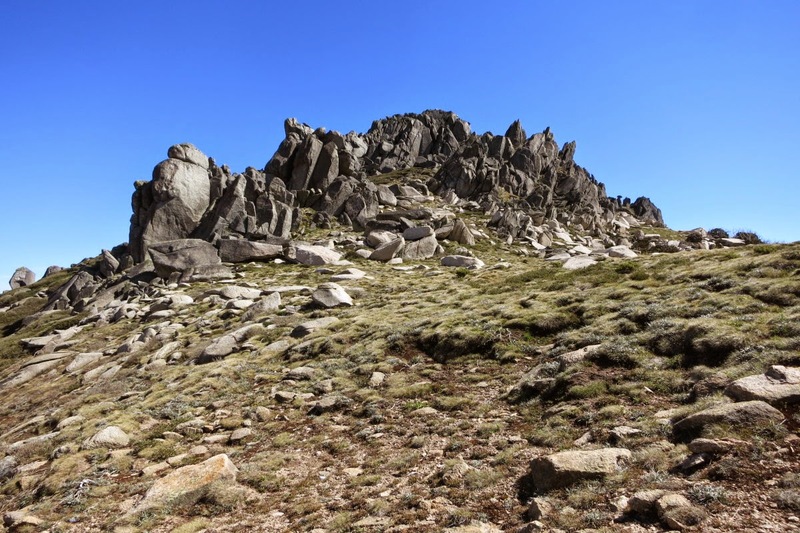 Of all the Snowy Mts peaks, South Rams Head is definitely one of the more interesting peaks to climb. 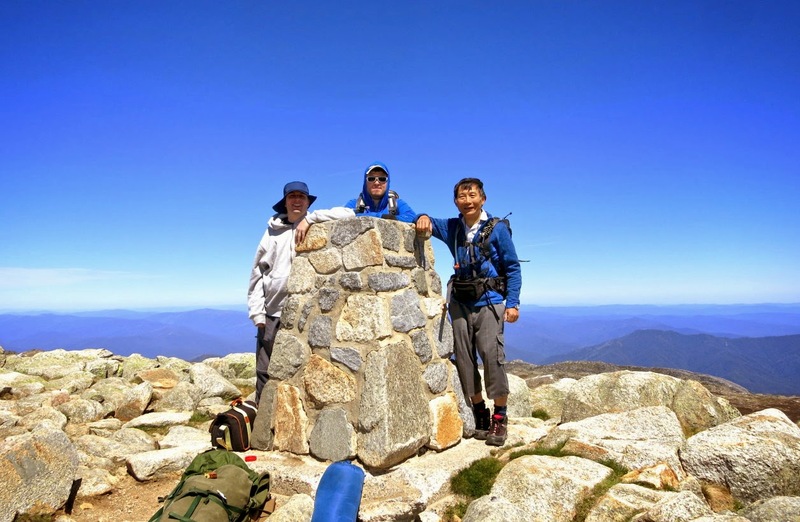 41) I am at the summit of South Rams Head 2052m, ranked 23 of the A2K peaks. 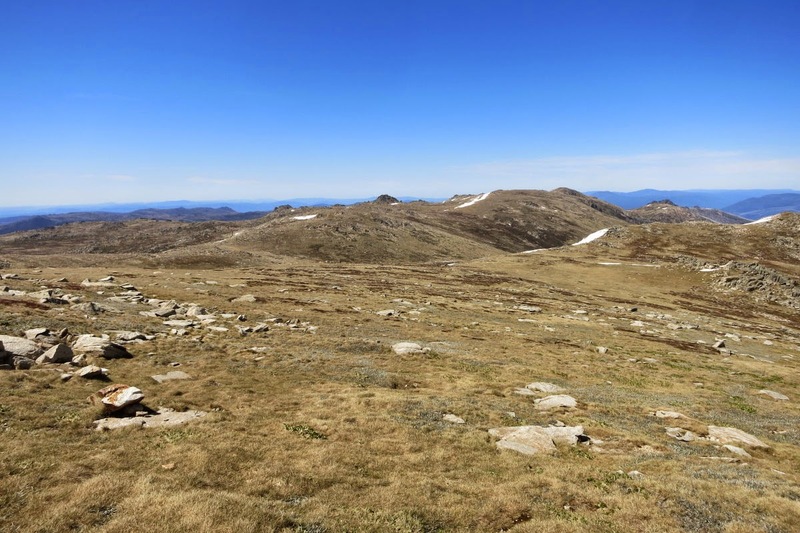 43) View from South Rams Head summit - directly north and at the centre of the pic is Mt Kosciuszko. To its right is Rams Head. 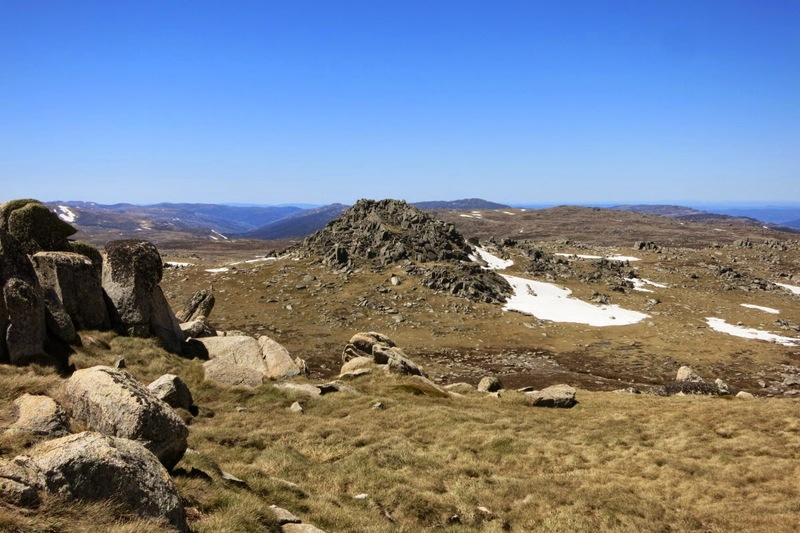 44) View from South Rams Head summit - looking down at Thredbo Valley through which the Thredbo River flows. 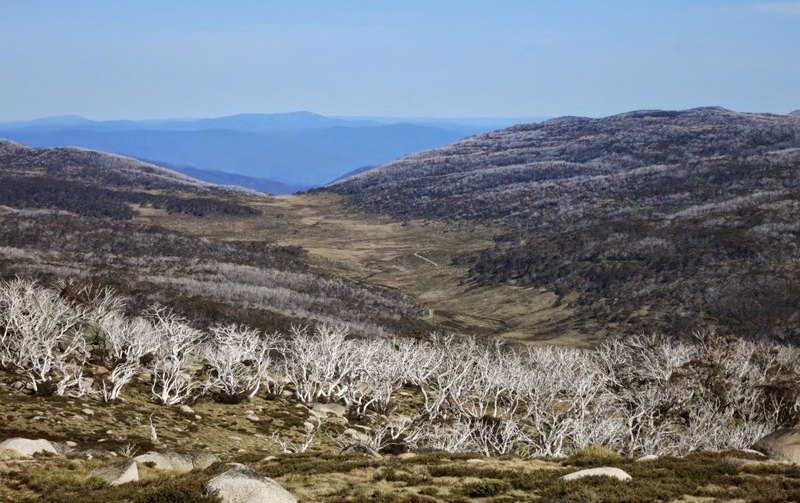 The Alpine Way from Jindabyne to Thredbo also meanders through this valley. Dead Horse Gap Carpark where our car is parked is also somewhere down in the valley. 45) We've climbed down South Rams Head and are looking back at it. 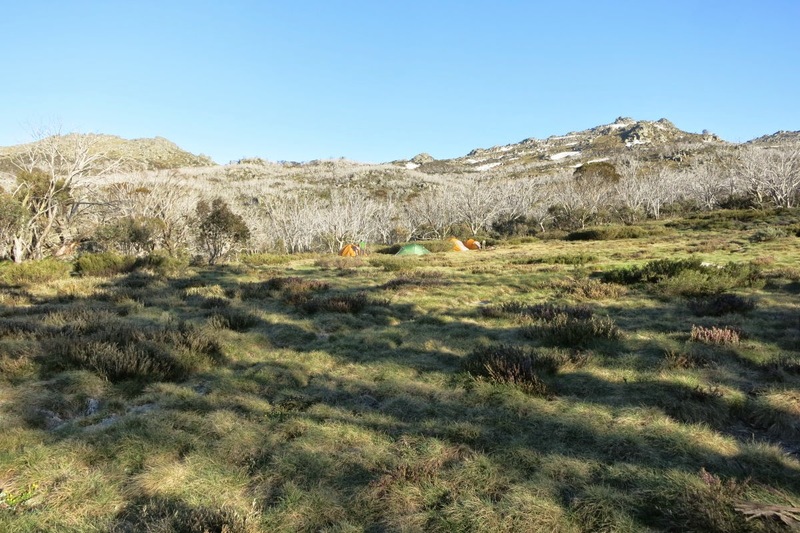 46) We head in a south-east-east direction towards the Dead Horse Gap Track. It is an unpleasant heavy-duty bushbashing to an otherwise magnificent day. 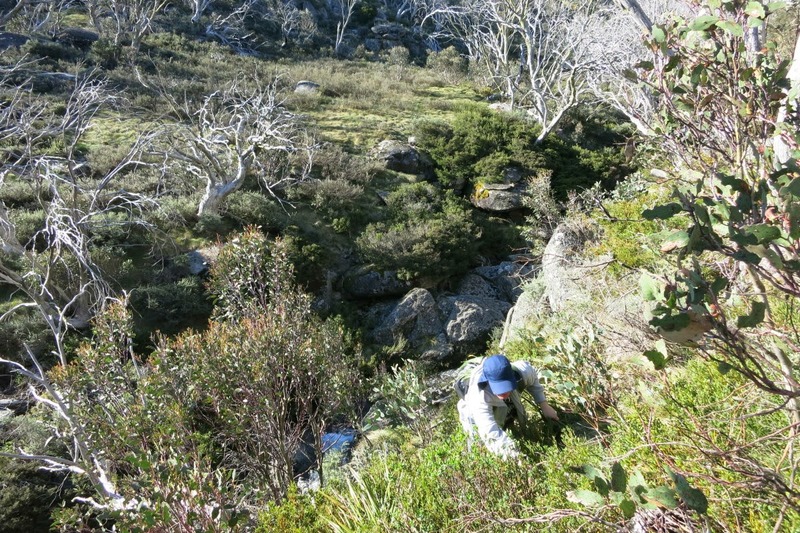 In this pic we had just crossed Bogong Creek; and Daniel is climbing up its steep bank. 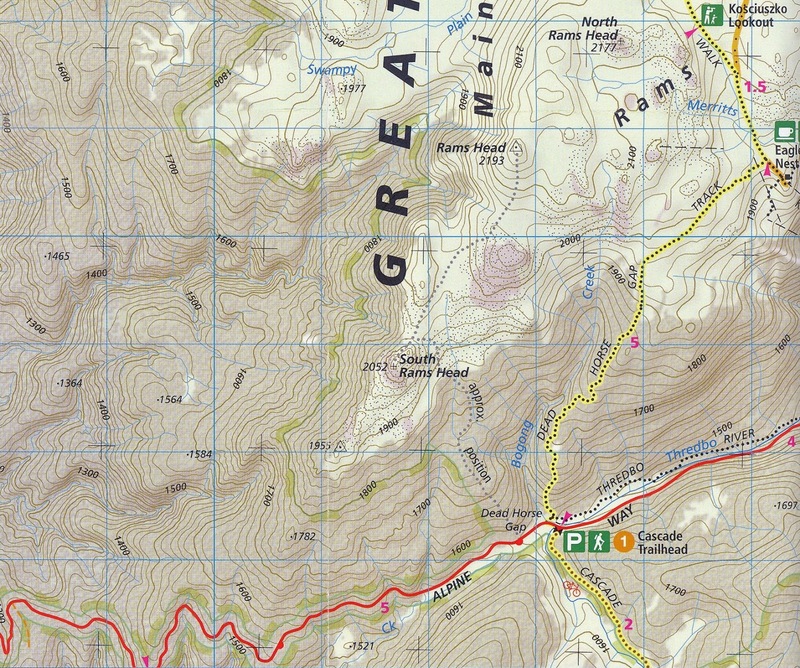 47) From South Rams Head, instead of bushbashing towards Dead Horse Gap Track like the way we just did, you are probably better off to follow the dotted line in this map towards the Alpine way. - A rewarding clear blue day - we achieved our objectives! - South Rams Head was the most fascinating climb of the lot ... see Photo #39. In the mean time, if you like to know the details, contact me. Hey I have a question, was it done in April? 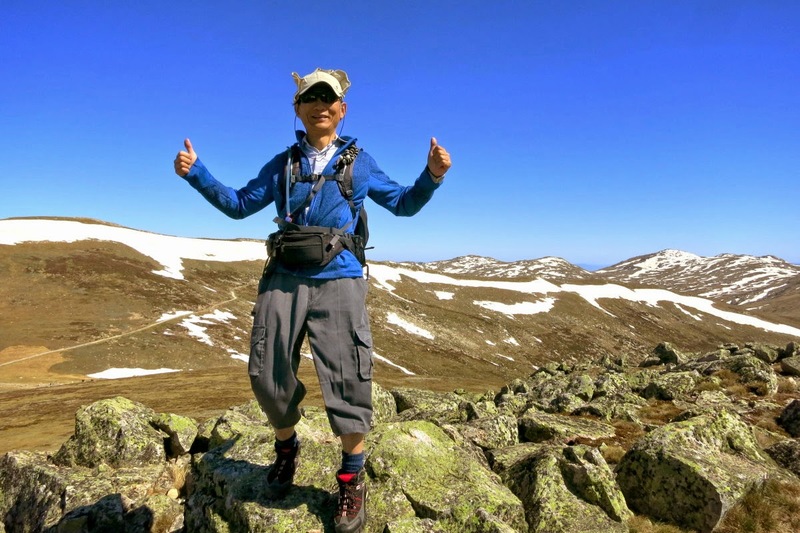 Is it possible to do it in July without having to wear snow shoes or being specially prepared? Or is it all covered in snow and is pretty icy? This trip was in November. 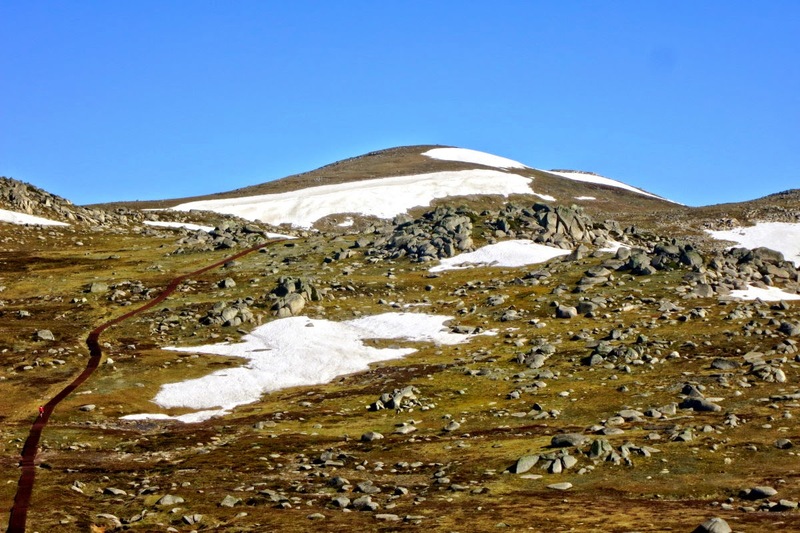 In July, the entire mountain will be under snow. 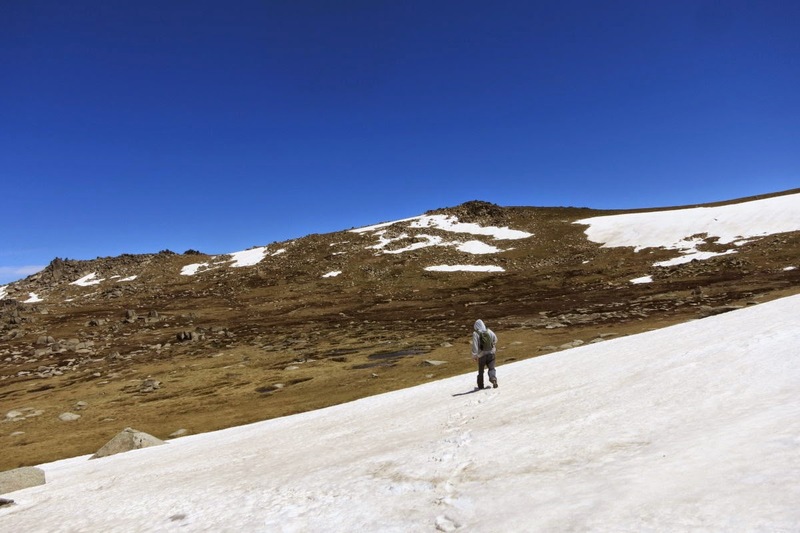 You'll need snow shoes or cross-country skis to venture up there.